Star United member Ed Cooning enjoys tasty cheese snacks while offering mad love to the Donna Ernst Memorial Trophy. 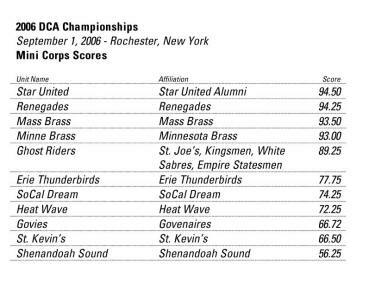 Rochester, New York, September 1, 2006 -- Star United placed first in the mini corps category of Drum Corps Associates' (DCA) Individual & Ensemble competition held in Rochester, New York on Friday, September 1, 2006. 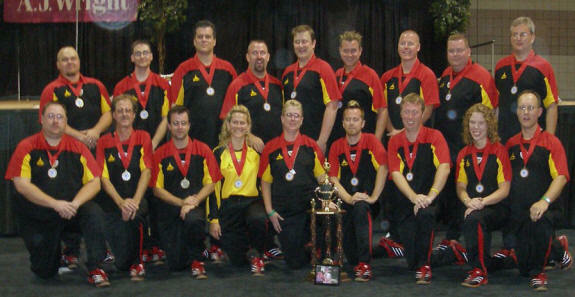 Star United performed for approximately 1,500 spectators and competitors at Rochester's Riverside Convention Center. The unit started its program with an excerpt from Walton's Belshazzar's Feast (Praise Ye), quickly following with Henry V, Amber Waves, and Festive Overture. The spirited performance yielded numerous standing ovations and propelled Star United to top honors, enabling the unit to narrowly edge out a mini corps from the San Francisco-based Renegades (see recap below). The unit performed their full repertoire as well as When You Wish Upon a Star (twice) as an encore following the awards ceremony, concluding an incredible evening for Star United and the Star Alumni Association. Star United is a performance ensemble composed of alumni of the Star of Indiana Drum and Bugle Corps, Brass Theater, and Blast!. The unit also features members from other drum corps or no drum corps affiliations. Star United is based in Indianapolis, Indiana and began rehearsing for this performance in the spring of 2006. 2006 Star United Members in Rochester, New York (front row, left to right): Matt Basey, Mike Morrow, Dan Solero, Becky Saddlemire, Nancy Brown, Ed Cooning, Kyle Gross, Julie Gerhardt, Kim Sommer. Top row (left to right): Brian Frederick, Dan Hubbard, Michael Chromik, Jon "Spike" Christl, Sean Conley, Chris Rutt, Matt Evans, Rob Dorocke, Randy Soules. Special congratulations to Nancy Brown and Sean Conley for their extraordinary efforts to facilitate the creation and success of this performance ensemble.